Those talks followed a lengthy meeting of Turkish President Recep Tayyip Erdogan, Mr Cavusoglu and Mr Tillerson late on Thursday at which a broad range of disagreements were covered. They included Ankara’s complaints against a US-based Turkish cleric Mr Erdogan accuses of fomenting a failed 2016 coup, US concerns about the state of Turkey’s democracy and opposition to Turkey’s planned purchase of a Russian air defence system. 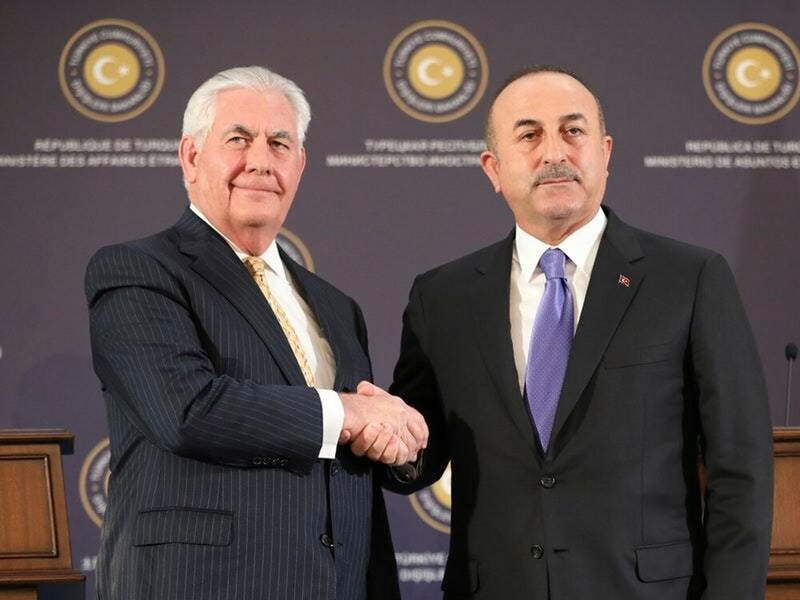 “We brought forward proposals on how we can address all of the critical issues that are standing between our countries,” Mr Tillerson said during a joint news conference with Mr Cavusoglu. He said joint working groups would take up specific issues including troop deployments to address Turkish border security concerns before the middle of March. Turkey is riled over Washington’s support to the YPG — the top US ally in the fight against the Islamic State group. Turkey considers it a “terrorist” group linked to Kurdish rebels fighting inside Turkey. Compounding the difficulties over Syria, ties had also been damaged by what Ankara perceives to be Washington’s reluctance to extradite US-based cleric Fethullah Gulen and the trial in the US of a banker accused of helping Iran evade sanctions. For its part, Washington is angered by the detention of journalists and opposition figures, American citizens and Turkish employees of US consulates in Turkey on alleged terror charges. “We find ourselves at a bit of a crisis point in the relationship,” Mr Tillerson said. But, he also stressed the long-standing nature of the relationship. Such rhetoric was absent on Friday and US officials expressed hope that it would not resurface in the days after Mr Tillerson’s visit, which followed a similar trip earlier this month by national security adviser HR McMaster. Mr Tillerson said the first working group would deal with the issue of the town of Manbij, held by the US-backed Syrian Kurdish militia where the US has a military presence. Turkey has long pressed the US to ensure the YPG leaves Manbij and has threatened to extend an offensive to drive Syrian Kurds from a border enclave to that region. US officials said one idea to be considered is to place Turkish troops alongside American soldiers stationed in northern Syria to improve transparency. Mr Cavusoglu repeated that promises made by the previous US administration about the YPG moving to the east of the river Euphrates had been broken.